The Asiatic-Pacific Theater, was the theater of operations of U.S. forces during World War II in the Pacific War during 1941–45. From mid-1942 until the end of the war in 1945, there were two U.S. operational commands in the Pacific. The Pacific Ocean Areas (POA), divided into the Central Pacific Area, the North Pacific Area and the South Pacific Area,  :652–653 were commanded by Admiral Chester W. Nimitz, Commander-in-Chief Pacific Ocean Areas. The South West Pacific Area (SWPA) was commanded by General Douglas MacArthur, Supreme Allied Commander South West Pacific Area. During 1945, the United States added the United States Strategic Air Forces in the Pacific, commanded by General Carl A. Spaatz. Chester William Nimitz, Sr. was a fleet admiral of the United States Navy. 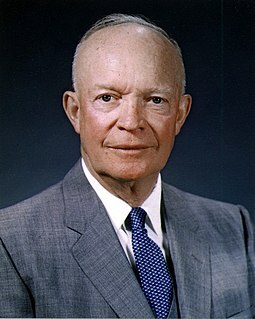 He played a major role in the naval history of World War II as Commander in Chief, U.S. Pacific Fleet and Commander in Chief, Pacific Ocean Areas, commanding Allied air, land, and sea forces during World War II. The Aleutian Islands Campaign was a military campaign conducted by the United States and Japan in the Aleutian Islands, part of the Alaska Territory, in the American theater and the Pacific theater of World War II starting on 3 June 1942. A small Japanese force occupied the islands of Attu and Kiska, where the remoteness of the islands and the challenges of weather and terrain delayed a larger U.S.-Canadian force sent to eject them for nearly a year. The islands' strategic value was their ability to control Pacific transportation routes, which is why U.S. General Billy Mitchell stated to the U.S. Congress in 1935, "I believe that in the future, whoever holds Alaska will hold the world. I think it is the most important strategic place in the world." The Japanese reasoned that control of the Aleutians would prevent a possible U.S. attack across the Northern Pacific. Similarly, the U.S. feared that the islands would be used as bases from which to launch aerial assaults against the West Coast. The Battle of the Komandorski Islands was a naval battle between American and Imperial Japanese forces which took place on 27 March 1943 in the North Pacific, south of the Soviet Komandorski Islands. The battle was a daylight surface engagement in which air support played a negligible role and in which the inferior American force escaped complete destruction mostly by luck. The Battle of Makin was an engagement of the Pacific campaign of World War II, fought from 20 to 23 November 1943, on Makin Atoll in the Gilbert Islands. The Battle of the Philippine Sea was a major naval battle of World War II that eliminated the Imperial Japanese Navy's ability to conduct large-scale carrier actions. It took place during the United States' amphibious invasion of the Mariana Islands during the Pacific War. 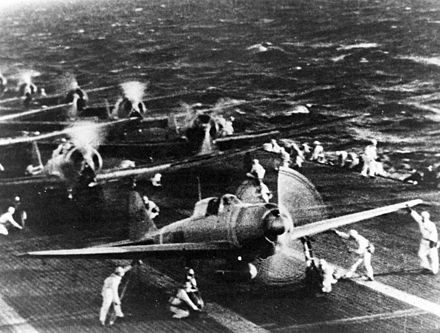 The battle was the last of five major "carrier-versus-carrier" engagements between American and Japanese naval forces, and pitted elements of the United States Navy's Fifth Fleet against ships and aircraft of the Imperial Japanese Navy's Mobile Fleet and nearby island garrisons. This was the largest carrier-to-carrier battle in history. The Second Battle of Guam was the American recapture of the Japanese-held island of Guam, a U.S. territory in the Mariana Islands captured by the Japanese from the U.S. in the 1941 First Battle of Guam during the Pacific campaign of World War II. The Attack on Pearl Harbor was a surprise military strike by the Imperial Japanese Navy Air Service against the United States naval base at Pearl Harbor, Hawaii Territory, on the morning of December 7, 1941. 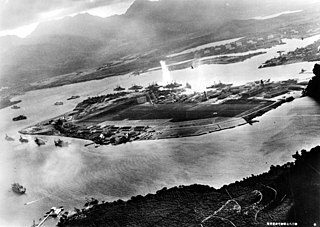 The attack, also known as the Battle of Pearl Harbor, led to the United States' formal entry into World War II. The Japanese military leadership referred to the attack as the Hawaii Operation and Operation AI, and as Operation Z during its planning. The Battle of Wake Island began simultaneously with the attack on Pearl Harbor naval/air bases in Hawaii and ended on 23 December 1941, with the surrender of the American forces to the Empire of Japan. 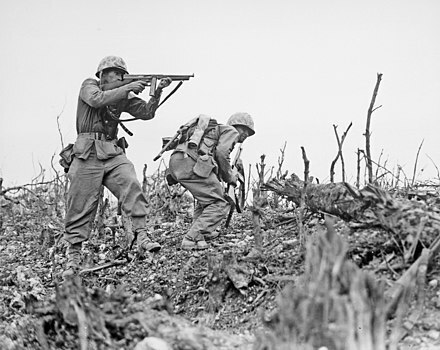 It was fought on and around the atoll formed by Wake Island and its minor islets of Peale and Wilkes Islands by the air, land, and naval forces of the Japanese Empire against those of the United States, with Marines playing a prominent role on both sides. ↑ By US Navy's Third Fleet under Admirals Halsey and Nimitz. ↑ By US Navy's Task Force 38 under Admirals Mitscher and Nimitz. 1 2 3 4 5 6 7 8 9 Potter & Nimitz (1960). 1 2 3 4 5 6 7 8 9 Silverstone (1968) pp.9–11. ↑ Kafka & Pepperburg (1946) p.185. ↑ Silverstone 1968, pp. 9–11. 1 2 3 Sulzberger 1966, pp. 332–333. ↑ Potter & Nimitz 1960 , p. 759. ↑ U.S. Army Center of Military History. "World War II – Asiatic-Pacific Theater Campaigns – U.S. Army Center of Military History". U.S. Army Center of Military History. U.S. Army Center of Military History. Retrieved 21 October 2015. Pacific Ocean Areas was a major Allied military command in the Pacific Ocean theater of World War II. It was one of four major Allied commands during the Pacific War, and one of three United States commands in the Asiatic-Pacific Theater. Admiral Chester W. Nimitz of the U.S. Navy, Commander in Chief, U.S. Pacific Fleet, headed the command throughout its existence. USS Custer (AP-85/APA-40) was a Bayfield-class attack transport that served with the U.S. Navy during World War II in the Pacific Ocean theatre of operations. She carried troops into invasion areas and landed them, and, for this dangerous work, she returned home for decommissioning post-war with six battle stars to her credit. USS LST-469 was a United States Navy LST-1-class tank landing ship used in the Asiatic-Pacific Theater during World War II. As with many of her class, the ship was never named. Instead, she was referred to by her hull designation. USS LST-459 was a United States Navy LST-1-class tank landing ship used in the Asiatic-Pacific Theater during World War II. As with many of her class, the ship was never named. Instead, she was referred to by her hull designation. USS LST-452 was a United States Navy LST-1-class tank landing ship used in the Asiatic-Pacific Theater during World War II. USS LST-454 was a United States Navy LST-1-class tank landing ship used in the Asiatic-Pacific Theater during World War II. USS LST-456 was a United States Navy LST-1-class tank landing ship used in the Asiatic-Pacific Theater during World War II. USS LST-458 was a United States Navy LST-1-class tank landing ship used in the Asiatic-Pacific Theater during World War II. USS LST-460 was a United States Navy LST-1-class tank landing ship used in the Asiatic-Pacific Theater during World War II. As with many of her class, the ship was never named. Instead, she was referred to by her hull designation. USS LST-462 was a United States Navy LST-1-class tank landing ship used in the Asiatic-Pacific Theater during World War II. As with many of her class, the ship was never named. Instead, she was referred to by her hull designation. USS LST-463 was a United States Navy LST-1-class tank landing ship used in the Asiatic-Pacific Theater during World War II. As with many of her class, the ship was never named. Instead, she was referred to by her hull designation. USS LST-466 was a United States Navy LST-1-class tank landing ship used in the Asiatic-Pacific Theater during World War II. As with many of her class, the ship was never named. Instead, she was referred to by her hull designation. USS LST-468 was a United States Navy LST-1-class tank landing ship used in the Asiatic-Pacific Theater during World War II. As with many of her class, the ship was never named. Instead, she was referred to by her hull designation. USS LST-470 was a United States Navy LST-1-class tank landing ship used in the Asiatic-Pacific Theater during World War II. As with many of her class, the ship was never named. Instead, she was referred to by her hull designation. USS LST-474 was a United States Navy LST-1-class tank landing ship used in the Asiatic-Pacific Theater during World War II. As with many of her class, the ship was never named. Instead, she was referred to by her hull designation. USS LST-475 was a United States Navy LST-1-class tank landing ship used in the Asiatic-Pacific Theater during World War II. As with many of her class, the ship was never named. Instead, she was referred to by her hull designation.